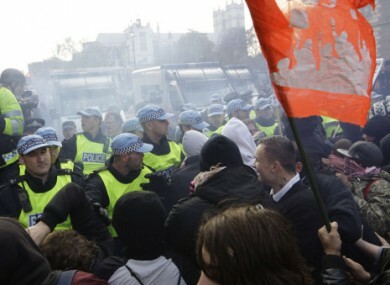 Protesters clash with police over tuition fee hikes at Whitehall, London, today. MORE THAN A DOZEN PEOPLE were arrested in London today as after student protesters clashed with police and attacked a police vehicle. Students in different parts of the UK took to the streets to protest against a hike in their tuition fees from £3,290 a year to £9,00o per annum. Today’s demonstrations follow protests earlier this month in London which resulted in violent clashes between protesters and police, and saw a small crowd break into the Conservative party’s headquarters. One student involved in those protests pleaded guilty today to throwing a fire extinguisher from the roof of the government party’s building, according to Reuters. The BBC reported today that lines of police are holding back thousands of protesters in London today. An estimated 10,000 people turned out for the marches in London. Students had planned to protest outside the Liberal Democrats headquarters, which was spared during the unrest earlier this month. The president of the National Union of Students urged participants to engage in peaceful protest. Students accuse the Lib Dem party of reneging on their election pledge to vote against higher tuition fees. I hate in politics, as in life, to make promises that you then find you can’t keep… We made a promise we can’t deliver – we didn’t win the election outright and there are compromises in coalition. Clegg has been advised to stop cycling to Downing Street as a result of a threat made against him by angry students. The Telegraph reports that the security warning was made before today’s protests got underway. Police said they arrested 15 people on suspicion of theft, violent disorder, criminal damage, or burglary, according to the PA. At least one policeman was injured. The Guardian reports that thousands of university students and schoolchildren around the country took part in the protest by walking out of their schools and universities this afternoon. Students are staging sit-ins at third-level buildings. One 14-year-old protester involved in the sit-in at Oxford University told the Guardian his parents had given him permission to take part. He said he wanted to get involved because while the fee increase won’t stop him from going on to third-level education, “it’ll mean I’m in loads of debt and it just makes everything a little bit worse”. Email “Video: UK student protesters clash with police”. Feedback on “Video: UK student protesters clash with police”.